Earlier this month we talked about some of the great ways to use a custom t-shirt to promote your brand. Today’s product spotlight takes that concept a step further, especially if you’re focusing on kids. 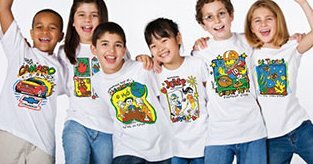 The “Luv 2 Color” t-shirt is essentially a wearable coloring book. The white t-shirt comes imprinted with your choice of a stock or free custom design in black, and includes a set of six markers. Kids can color in the design however they choose — and can do so again and again, as the color easily washes out in warm water! Wow! This is an awesome product. I actually checked our existing suppliers if they have this and luck didn’t find me – at all. Awesome Item! Very creative and Intuitive. Now, now, how do we source for this product? tweedledee, tweedledum.